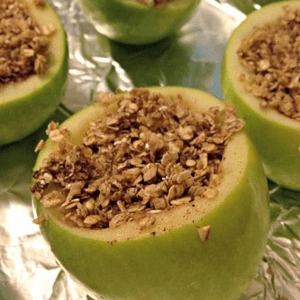 Enjoy these Baked Green Apples for a sweet and savory after-dinner treat! Line a baking sheet or pan with tinfoil, and set aside. Wash apples and cut off the tops. Use a spoon to scoop out the flesh to make a bowl for the filling. Leave about 1/4 inch around the edge for the "rim" of the bowl, and be careful not to puncture the bottom of the apple. Discard cores and seeds, and finely chop the remaining "filling" of the apple (the part you scooped out). Mix oats, spices, apple pieces, vanilla, honey and coconut oil in a small bowl until well combined and the oats form a crumble. 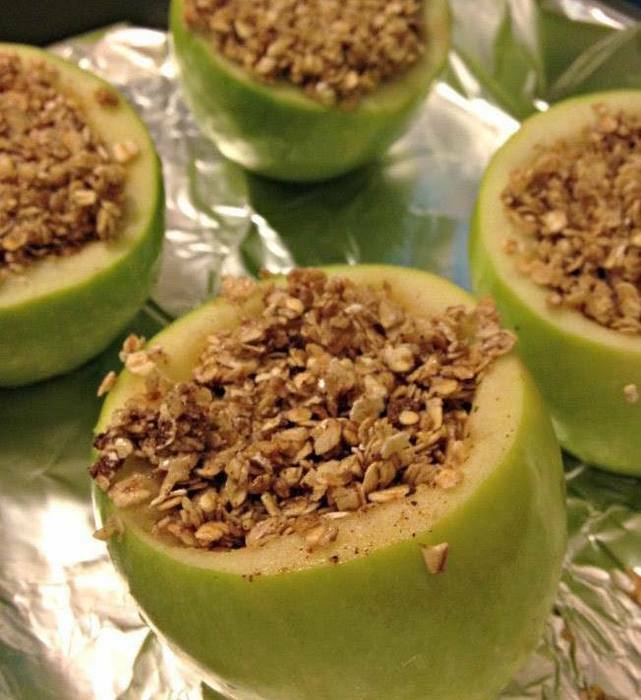 Fill apple "bowls" with a heaping 1/4 cup of crumble, and place on prepared baking sheet. Bake for 30-35 minutes, or until the crumble is golden brown and apple is tender.